This is our custom-built DMX Terminator with a Neutrik 5 Pin XLR. 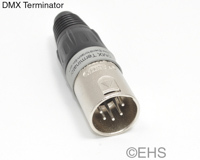 We custom build our terminators with higher power components to give longer life and better resistance to spikes and interference than standard off-the-shelf terminators. Select the optional color boot to make it stand out or identify it.